Jim Peterik has said that the album's title came from a comment made by Brian in response to Peterik's description of an AM radio broadcast filtering through a car's oval speaker. According to record producer Joe Thomas, Brian Wilson circa 2008 or 2010 inquired to him about demo tapes recorded during the sessions for Wilson's 1998 solo album Imagination which Thomas co-produced: "He called up and said I've got some ideas for some new Beach Boys songs, and I said, That’s great, and I pointed out to him that when we worked together several years ago he had the genesis of some other Beach Boy songs that he had never really wanted to put on any of his solo records. That he had isolated specifically for the Beach Boys. So he asked me to compile those and it was more than a few." The two proceeded to meet with Mike Love in Palm Springs, who then agreed to a collaboration. In the late 2000s, reports began to circulate that the surviving members of the Beach Boys would reunite for a 50th Anniversary tour and album. Despite some uncertainty and initial denials, on December 16, 2011 it was announced that Brian Wilson, Mike Love, Al Jardine, Bruce Johnston and David Marks would reunite for a new album and The Beach Boys 50th Anniversary Reunion Tour. The studio reunion was kicked off by a remake of the band's 1968 single, "Do It Again", recorded earlier that May. The next day, the group recorded the album's opening track, "Think About the Days". He really wanted to do like a kind of reflection of California from the standpoint of a, you know, a guy who’s almost 70 years old. So it’s driving down Pacific Coast Highway and thinking about his life in retrospect. So this suite was a series of maybe one or two minute vignettes that he had like 15 of them that he would start and never finish. When I put them together on ProTools, it was eerie to me that they all fit together. It was like, wow. This song was written a year before the song that followed it, but yet they fit completely perfectly: modulation, key move, the whole thing. Then Brian started assembling these little bits and I kind of dreamed… I was 10 years old when Smile was recorded, but I kind of dreamed that was how that happened. I have no special authority to tell you that’s how it did. It just seemed like all these little pieces became like this theme, and instead of being Americana or whatever Smile was, it was his drive down Pacific Coast Highway. Sometimes he’ll have a great chorus and I’ll just add a couple lines in a verse. Or a lot of times we’ll just play. What Brian likes is chords. So I’ll play the piano and I’ll play maybe five or six or seven chord progressions, and we’ll just sit there. And sometimes he won’t say anything, and then all of sudden he’ll come up with this brilliant melody while I’m playing the chords. Many of the songs were written in collaboration with Thomas, whose input sometimes included entire chord progressions. Classified as baroque pop, many of the songs have a considerable history: "That's Why God Made the Radio" was written by Brian Wilson, Jim Peterik, Joe Thomas and Larry Millas back in the late 1990s, and that "about 80 hours worth" of demo tapes were sourced from that period. "Spring Vacation" originated during Your Imagination and contained new lyrics by Love written reportedly in five minutes. The track "Summer's Gone" was originally meant to be the final song on the final Beach Boys album, and according to Thomas, the album's original title was Summer's Gone with the intention that it would be the final Beach Boys album. It was changed when Wilson decided he would like to record a follow-up. The song was written in reflection of his mother's death and the end of Carl's life, who died two months after their mother. Whereas songs like "From There to Back Again", "Isn't It Time", "Beaches in Mind", "Shelter" and "The Private Life of Bill and Sue" were written for the new album. During the band's June 15, 2012 show, a slight revision of "Isn't It Time" was performed, with some lyrics altered and a different vocal arrangement for the song's bridge. These revisions later appeared on the song's single release. The song "Daybreak Over the Ocean" was originally recorded in 1978 by Mike Love for his first, as yet unreleased solo album, First Love (and also re-recorded for his equally unreleased solo album of a few years ago, Mike Love Not War a.k.a. Unleash The Love: this is the version — with additional Beach Boys vocals — that appears on the album). Brian is still, as you would imagine, the taskmaster in terms of what people play. He’s in charge of those sessions. ... He arranges all the vocals and produces the record. I record it because I think he really likes the fact that technically… you gotta kind of keep up on all the techniques that are available to us right now and that’s kind of what my role is. He’s not going to tell me to use an SM-58 microphone instead of a U-67. He trusts me in that way. But he’s the producer in absolutely every way. I couldn’t even begin to think than anybody could produce Brian Wilson. It would be like how can anybody direct Richard Burton, you know? 28 songs were written and recorded for the album. Al Jardine stated that Carl Wilson's voice would be featured on the new album. Jardine said he found a song Carl had sung on and recorded and it will be used on the new song, "Waves of Love". Jardine said he only wished there was a way to include Dennis Wilson as well. However, while pre-recorded segments from both Carl and Dennis Wilson are featured during concerts on the band's 50th Anniversary Tour, neither "Waves of Love" nor any vocals from Carl or Dennis are featured in the final version of the new album. Johnston contributed one song titled, "She Believes in Love Again", a song he wrote in 1985 (and that was recorded by the band on that year's The Beach Boys); however, the song was not included on the final version of the new album. According to Johnston before its release, the album's track listing was determined by Capitol. The first single from the album, "That's Why God Made the Radio", made its national radio debut April 25, 2012, on ESPN's Mike and Mike in the Morning. It was released to the band's YouTube channel later that same day, with accompanying lyrics. In addition, the song has been released and is now available as a single on digital outlets such as iTunes and Amazon. As of September 2012[update], the album's title track, "Isn't It Time", and "Summer´s Gone" have been the only songs from the album to be performed live. The band appeared on various television shows throughout the tour performing the song, including an hour-long performance and interview segment on the shopping channel QVC in which close to 20,000 copies of the album were sold. QVC will give away an exclusive eleven track greatest hits CD with the purchase of the album. The hits CD will not be available anywhere else. On May 1, 2012, Walmart scheduled an exclusive limited edition 50th anniversary collection 'ZinePak, to include a 72-page magazine with rare photos and new interviews with the group, as well as an 11-song CD including the group's recent re-recording of "Do It Again". Doin' It Again, an hour-long documentary that aired during the summer of 2012 on PBS, was released on DVD and Blu-ray August 28, 2012. The documentary features a new biography with new interviews of the current lineup, footage of the band recording the new album, and live performances from the 50th anniversary tour. In November 2012, a DVD and Blu-ray titled The Beach Boys Live in Concert: 50th Anniversary was released featuring a performance by the band from July 2012 in Phoenix, AZ. The release featured a heavily edited performance which was cut down to sixty minutes and only 21 of the 50 songs performed. There was also mention of plans to release a DVD of their performance at Red Rocks although nothing has been officially announced. According to Bruce Johnston, the album's overall aesthetic compares to their 1970 album Sunflower. It received generally favorable reviews, and reviewers unanimously highlighted the album's four-song closing suite as its crowning moment, which Consequence of Sound called "a funeral dirge full of majesty" and The Guardian touted "the best thing Brian Wilson has put his name to in the last 30 years." Some critics were disparaging of the other more upbeat and lighthearted tracks in comparison, and one reviewer accused the band of using Auto-Tune. Others accredited the album's low points specifically to Mike Love's contributions, as NOW Magazine wrote "Since 'Ronald Reagan-lite Love' thinks the Beach Boys’ best period was their most profitable, we get bankable early 60s simplicity and zero evidence that these guys were once the coolest, funniest, strangest guys in music." Beats Per Minute summarized, "The album as a whole isn't flawless, yet by sounding utterly enchanting during its climax it leaves a listener feeling genuinely touched." In 2013, Mike Love expressed to various news outlets that he was "disappointed" with the album's direction, claiming that he was denied much songwriting input by an unnamed third party. "I was hoping to get together with Brian on That's Why God Made the Radio, but a guy who was involved in the production of that album engineered it otherwise," Love explains, "I talked to Brian about a year before we even started doing any of the recording for [the album]. He and I talked about doing a project and he was excited about doing it, but it never came to fruition at all. It was given another direction—not by me and not by Brian but by others. We were supposed to be allowed to get together to write songs from scratch like we did in the '60s, but that was never to be." It debuted at No. 3 and became the group's highest charting album in 37 years—since 1974's compilation Endless Summer and highest charting studio album since 1965's Summer Days (And Summer Nights!!). It also became the band's first top 10 studio album since 1976's 15 Big Ones and the highest debuting album of their entire career. The album made its debut in the UK charts at number 15 giving the group their highest studio album debut since 1971's Surf's Up. The album debuted at number 15 on the Canadian Albums Chart. 1. "Think About the Days"
2. "That's Why God Made the Radio"
5. "The Private Life of Bill and Sue"
10. "From There to Back Again"
^ The Beatles would tie that record with On Air – Live at the BBC Volume 2 the following year. Frank Sinatra holds the record at 52 years of top 10 albums. ^ Hajdu, David (June 8, 2012). "Where Did the Beach Boys' Sound Come From?". New Republic. ^ "Shades of Blue, Tiger Eyes & Beyond: Chatting with Joe Bonamassa, Jim Peterik and Sondre Lerche". The Huffington Post. September 22, 2014. ^ a b c d e f g h i j Romano, Andrew (May 2012). "The Joe Thomas Interview: On Brian Wilson, The Beach Boys Reunion, and That's Why God Made the Radio". Retrieved July 24, 2014. ^ "Beach Boys plan anniversary blowout, likely reunion tour". Retrieved September 25, 2011. ^ Michaels, Sean (September 29, 2011). "Brian Wilson rules out reunion with the Beach Boys". The Guardian. London. Retrieved September 29, 2011. ^ Pareles, Jon (February 17, 2012). "A Few Words With the Beach Boys". The New York Times. ^ a b c d e "The Beach Boys are making 'Radio' waves » Ventura County Star". Vcstar.com. ^ Shetty, Akshatha (September 4, 2012). "Where pop, rock, and classical meet". The New Indian Express. Retrieved 17 July 2014. ^ a b Graff, Gary (June 27, 2012). "Beach Boys Talk 'Another Album Together'". Billboard. ^ Fine, Jason (June 21, 2012). "The Beach Boys' Last Wave". Rolling Stone. p. 3. Retrieved July 23, 2012. ^ Boucher, Geoff (February 25, 2012). "Beach Boys ready for harmonic convergence on tour, album". Los Angeles Times. ^ a b Graff, Gary (April 23, 2012). "Beach Boys Album: 'It's All Brand New'". Billboard. Retrieved 5 July 2014. ^ "The Beach Boys Launch New Single and Announce New Album Details: 'That's Why God Made The Radio' to be Released June 5 by Capitol/EMI". PR Newswire. 2012-04-25. Retrieved 2015-09-29. ^ "Beach Boys to Have Highest Charting Album Since 1974". Ultimateclassicrock.com. ^ "Exclusive: Beach Boys Get a 'ZinePak for 50th Anniversary". Billboard. Retrieved 2013-05-22. ^ "Beach Boys tour coming to DVD". Social.entertainment.msn.com. Archived from the original on 2012-07-25. Retrieved 2012-09-22. ^ a b That's Why God Made The Radio at Metacritic. Retrieved 2013-07-27. ^ a b Bush, John (2012-06-05). "That's Why God Made the Radio - The Beach Boys : Songs, Reviews, Credits, Awards". AllMusic. Retrieved 2012-06-08. ^ a b "Album review". Consequence of Sound. Retrieved 2012-06-05. ^ "Album review". Entertainment Weekly. Retrieved 2012-06-05. ^ a b Petridis, Alexis (May 31, 2012). "The Beach Boys: That's Why God Made the Radio – review". The Guardian. London. Retrieved 27 July 2013. ^ a b Roberts, Randall (June 5, 2012). 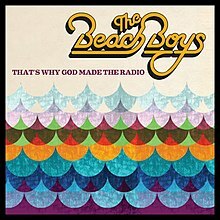 "Album review: The Beach Boys' 'That's Why God Made the Radio'". Los Angeles Times. latimesblogs.latimes.com. Retrieved 27 July 2013. ^ Bergstrom, John (2012-06-01). "The Beach Boys - 'That's Why God Made The Radio'". NME. Retrieved 2015-09-12. ^ a b Reed, Ryan. "Album review". Paste Magazine. Retrieved 27 July 2013. ^ Cardew, Ben (2012-06-05). "Album review". Rolling Stone. Retrieved 2012-06-09. ^ Young, Jon (2012-05-26). "The Beach Boys, 'That's Why God Made the Radio' (Capitol)". SPIN. Retrieved 2015-09-12. ^ Pareles, Jon; Chinen, Nate; Ratliff, Ben (June 4, 2012). "Another Solstice in an Endless Summer". New York Times. nytimes.com. Retrieved 27 July 2013. ^ Warren, Simone Scott. "A far more fitting end to the story than 'Stars And Stripes Volume 1' ever would have been". This Is Fake DIY. thisisfakediy.co.uk. Retrieved 27 July 2013. ^ Cain, Tim. "Album review". Herald Review. herald-review.com. Retrieved 27 July 2013. ^ Erret, Joshua. "Album review". NOW Magazine. nowtoronto.com. Retrieved 27 July 2013. ^ Phillimore, Alex (July 19, 2012). "Album review". Beats Per Minute. beatsperminute.com. Retrieved 27 July 2013. ^ Kim, Carr. "SURF'S UP AGAIN FOR THE BEACH BOYS". dailystar.co.uk. Retrieved 8 July 2012. ^ "The Beach Boys' Mike Love: 'There are a lot of fallacies about me'". The Guardian. July 4, 2013. Retrieved 15 August 2013. ^ Graff, Gary (August 14, 2013). "Mike Love 'Upset' Over Direction of Beach Boys Reunion Album, Tour". Billboard. Retrieved 15 August 2013. ^ "The Beach Boys' 50th Anniversary Studio Album, That's Why God Made The Radio, Debuts At Number 3 On Billboard Albums Chart". The Wall Street Journal. 13 June 2012. ^ a b c "Album charts". allmusic.com. Retrieved August 23, 2012. ^ "Translation result for Hmv.co.jp". Babelfish.yahoo.com. Archived from the original on 2007-10-10. Retrieved 2012-09-22. ^ "Shp6/5 The Beach Boys "That's Why God Made the Radio" CD". QVC.com. 2010-11-25. Retrieved 2012-05-27. ^ "Hit the sand and hang ten with the ultimate Beach Boys collection!". legacy.rd.com. 2012-07-03. Archived from the original on 2012-12-17. Retrieved 2012-07-03. ^ "Album charts" (ASP). Retrieved April 14, 2013. ^ "Album charts" (ASP). Hung Medien (in German). Retrieved August 23, 2012. ^ "Album charts" (ASP). Hung Medien (in Dutch). Ultratop. Retrieved August 23, 2012. ^ "Album charts" (ASP). danishcharts.com. Retrieved August 23, 2012. ^ "Album charts" (ASP). dutchcharts.nl. MegaCharts. Retrieved August 23, 2012. ^ "Album charts" (ASP). Hung Medien. Retrieved August 23, 2012. ^ "Album charts" (ASP). Hung Medien (in French). Syndicat National de l'Édition Phonographique. Retrieved August 23, 2012. ^ "Album charts" (in German). Media Control. Retrieved August 23, 2012. ^ "Album charts". oricon.co.jp (in Japanese). Oricon Style. Retrieved August 23, 2012. ^ "Album charts" (ASP). Hung Medien. VG-lista. Retrieved August 23, 2012. ^ "Album charts" (ASP). spanishcharts.com. Retrieved August 23, 2012. ^ "Album charts" (ASP) (in Swedish). Retrieved August 23, 2012. ^ "Album charts" (ASP). Hung Medien (in German). Swiss Music Charts. Retrieved August 23, 2012. ^ "Album charts". The Official Charts Company. 6 May 2013. ^ "Vinyl Albums : September 1, 2012". Billboard. Retrieved July 6, 2015. This page was last edited on 1 March 2019, at 18:56 (UTC).